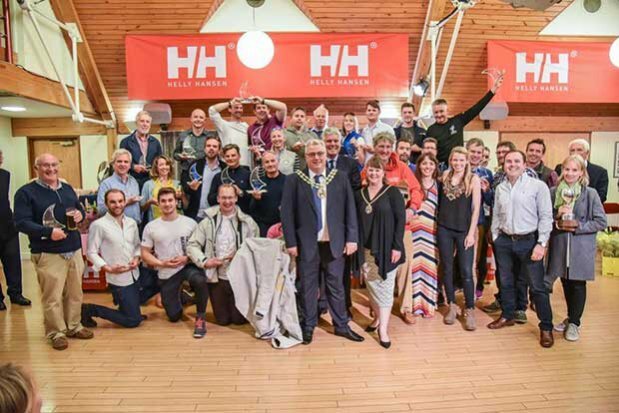 Spirits were high at the packed prize giving held at the Warsash Sailing Club on the River Hamble, for the Helly Hansen Warsash Spring Series and Crewsaver Warsash Spring Championship 2017 on Friday 19th May. All class winners were awarded with a fine glass yacht trophy. Series class winners were also awarded a Helly Hansen HP Foil Jacket and Trousers, courtesy of Helly Hansen, and championship class winners received either 180N Pro Auto lifejacket or Crewfit 165N Sport lifejacket, courtesy of Crewsaver. 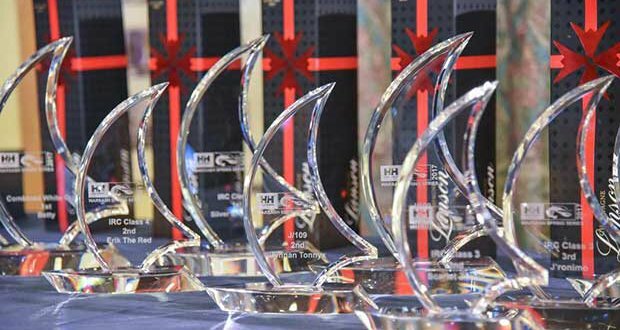 Presenting the awards were Richard Nichols, Marketing Executive at Helly Hansen and Hazel Proudlock, Marketing Assistant at Crewsaver. Speaking at the prize giving Richard Nichols commented: “It’s great to be here and it was a real pleasure to present the prizes, and meet the crews and skippers who have been competing this year. The beautiful Helly Hansen Trophy, presented by Richard, was awarded to the SB20 Trouble & Strife and the boys from Radley College, Oxfordshire for their outstanding achievement in winning their class in the series and coming third in the championship. Accepting the prize was George Barker who coaches the boys: “This is just fantastic; the boys will be so pleased to have won the trophy. They were incredibly proud to have won the series, it was a great achievement for them. They couldn’t come to the prize giving unfortunately because they are in the middle of exams but we are going to have a party next week so they will get a chance to celebrate”. The boys ranging from ages 14 to 18, will be going on to compete in Cowes Week 2017 in August and we wish them the best of luck. The Founder’s Salver is awarded to a non-IRC class boat and was presented in memory of Tom Cozens, one of the founders of the Warsash Sailing Club 59 years ago. It’s a replica of the salver presented to Tom by all the clubs on the River Hamble. This year the salver was awarded to Jonathan Powell and his J/80 Betty. Betty won her class in the championship for the fourth year running, and won her class in the series for the fifth year in succession. Congratulations! The Warsash Commodore’s Cup, awarded for merit and achievement in an IRC class, went to Rob Bottomley’s Sailplane (Beneteau First 40) who won the IRC2 class handsomely in the series. The 2018 Helly Hansen Warsash Spring Series will start on 18th March 2018 with the Spring Championship taking place on the last two weekends of April. Helly Hansen Warsash Spring Series class winners: IRC1 Knight Owl II, IRC2 Sailplane, IRC3 Quokka, IRC4 Silver Shamrock, J/88 J-Dream, J/109 Jiraffe, J/70 Offbeat, J/80 Betty, SB20 Trouble & Strife. Crewsaver Warsash Championship class winners: IRC1 Nifty, IRC2 No Retreat!, IRC3 Jumblesail 2, IRC4 Silver Shamrock, J/88 J-Dream, J/109 Jukebox, Quarter Tonner Aguila, J/70 Team Spitfire, J/80 Betty, SB20 PB2. You can read the full series and championship results at event website.